Young Link is the incarnation of Link from The Legend of Zelda: Ocarina of Time and The Legend of Zelda: Majora's Mask. In The Legend of Zelda: Ocarina of Time, this young, child version of Link turns into the adult version of him about midway through the game, after pulling out the Master Sword. In The Legend of Zelda: Majora's Mask, the player plays as Young Link throughout its entirety. 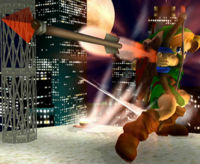 Young Link appears as a playable fighter in Super Smash Bros. Melee, being treated as a separate character from the adult Link. After being absent as a fighter in Super Smash Bros. Brawl, Super Smash Bros. for Nintendo 3DS, and Super Smash Bros. for Wii U, he returned in Super Smash Bros. Ultimate. 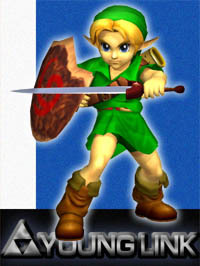 Young Link is shown to be quite skilled with a short sword, as well as many other weapons. Artwork for Young Link from Super Smash Bros. Melee. In Super Smash Bros Melee, Young Link is an unlockable character, unlocked by beating Classic or Adventure Mode with 10 characters, including Link and Zelda/Sheik, or by playing 500 Melee matches, and he then must be defeated on Great Bay. Young Link's moves are similar to Link's, though while Young Link is faster and lighter, he is also weaker. As Young Link is shorter and wields the smaller Kokiri Sword, his attacks do not have as much range. Young Link's Deku Shield is also not as strong as Link's Hylian Shield, as it does not protect against stronger projectiles. Young Link, however, can Wall Jump, which Link is not able to do. Young Link is voiced Fujiko Takimoto, who provided his voice clips for The Legend of Zelda: Ocarina of Time and The Legend of Zelda: Majora's Mask. In Super Smash Bros. Brawl, Young Link is one of the five playable characters from Super Smash Bros. Melee who is no longer playable in this game (the other four being Dr. Mario, Pichu, Mewtwo, and Roy), possibly being replaced by Toon Link, who functions very similarly to Young Link. However, he does have a collectible Sticker, and is playable in a demo of The Legend of Zelda: Ocarina of Time. 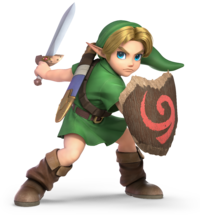 Young Link, after being absent as a fighter in the previous three Super Smash Bros. games, returns as an unlockable playable fighter in Super Smash Bros. Ultimate. Due to Link's The Legend of Zelda: Breath of the Wild-based changes, Young Link is now considered an entirely unique fighter from him, though his moveset shares a few similarities with Toon Link's. Young Link gains a Final Smash, the Triforce Slash, which he shares with Toon Link. Young Link benefits from universal changes: his overall mobility is faster, his short hop timing is reduced, his aerials have less landing lag, and he can use ground attack out of a run and use his aerials on ladders. Young Link's recovery is better, since his double jump grants more height, while directionally air dodging does not leave him helpless anymore. However, Young Link's air and falling speeds are decreased, unlike fellow veterans; additionally, some of his moves deal less damage and knockback, or more startup and ending lag. Young Link's Classic Mode route pits him against fighters from The Legend of Zelda series. The Fire Bow is Young Link's standard special move in Super Smash Bros. Melee and Super Smash Bros. Ultimate, based on the Fire Arrow upgrade recurring throughout The Legend of Zelda series. The move deals less damage than Link's Bow, and the arrow does not travel as far, but has a longer hitstun and deals fire damage. In Super Smash Bros. for Nintendo 3DS and Super Smash Bros. for Wii U, one of the custom variations for Toon Link's Hero's Bow is the Fire Bow, with a similar effect to Young Link's Fire Bow. The Boomerang from The Legend of Zelda series is Young Link's side special move in Super Smash Bros. Melee and Super Smash Bros. Ultimate, shared with Link and Toon Link. It is designed specifically after the one used in The Legend of Zelda: Ocarina of Time. 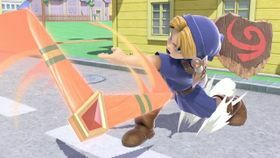 When thrown, the Boomerang damages any opponents it hits and automatically returns to Young Link once it hits an opponent or wall. The player can hold the control stick to make it fly farther, and it can also be thrown diagonally. The Boomerang can also fly up or down while it is active by tilting the control stick just before throwing it. Compared to Link's Boomerang, Young Link's Boomerang does not travel as far, and it is not as powerful, but it can be controlled better. The Spin Attack is Young Link's up special move in Super Smash Bros. Melee and Super Smash Bros. Ultimate. 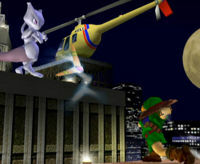 Shared with Link and Toon Link, the move is based on the Spin Attack move recurring throughout The Legend of Zelda series. When used, the character spins around rapidly with their sword to deal damage. When used in the air, the move also gives the character some vertical and horizontal distance. Unlike Link's Spin Attack, Young Link's version of the move, as well as Toon Link's version, can draw in opponents to deal multiple hits, although Young Link's has less range. The Bomb is Young Link's down special move in Super Smash Bros. Melee and Super Smash Bros. Ultimate, shared with Link and Toon Link, and based on the item recurring throughout The Legend of Zelda series. Young Link's Bomb in particular is based on the ones from The Legend of Zelda: Ocarina of Time. 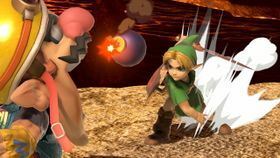 When used, Young Link pulls a Bomb out that can then be thrown at other characters to do damage, exploding on impact. Like other explosives, the bombs also deal damage to the holder; it can also be caught and thrown by opponents, or detonate in the player's hands. Unlike Link and Toon Link's Bombs, the explosion from Young Link's Bombs can hit multiple times. The player cannot use the move while holding another item, as Bombs count as an item. In Super Smash Bros. Ultimate, Young Link gains the Triforce Slash as his Final Smash. Like with Toon Link (and Link in the previous games), Young Link fires an arrow and traps an opponent between two Triforces. He then rushes forward and repeatedly slashes at them before thrusting and launching them away. Young Link appears in the microgame Ocarina of Time in WarioWare: Smooth Moves (found in 9-Volt's stage). The object is to have him pull the Master Sword by the Janitor form, and he will transform into a different form depending on the level: Adult Link on level 1, an elderly Link on level 2, or a Cucco on level 3. This microgame reappears in WarioWare Gold. Down + B: Bomb With a youthful spring in his step, Young Link can perform amazing wall-jumps. Once he hits a wall, tap the Control Stick in the opposite direction to send him leaping upward; you can practice to your heart's content in Target Test. His Spin Attack can strike multiple times even on the ground, and although it's hard to discern, so do his Bombs. Pit: Is it just me, or has Link lost weight? Palutena: Yes and no. That's Young Link. He's the child version of the Hero of Time. Pit: The Hero of Time? Palutena: The Link who mastered the Ocarina of Time and faced Ganondorf. Link's actions as the Hero of Time created parallel worlds, and from there, many different legends were born. Pit: I don't follow. What do you mean? Viridi: If you were defeated by Medusa, Palutena wouldn't be here today, right? Pit: True, but what does that have to do with anything? Viridi: We may have triumphed over Medusa in this timeline, but in a different timeline, you lost that fight, leaving Medusa and Hades to rule the world. Every action and inaction creates infinite parallel worlds! You're only in one of them. Pit: Wait... I'm not the only me? And nothing I do matters because another me will do the opposite? THEN WHAT'S THE POINT OF DOING ANYTHING! Palutena: Breathe, Pit! Focus on Young Link's short reach. He may be fast, but try to outrange him and anticipate his movements. This page was last edited on March 25, 2019, at 21:46.